Mexico City.- During the signing of the agreement to expand Once TV México coverage, President Felipe Calderón declared that this is the first step towards a public television station that will reach the whole country, as well as a complement to private television stations in Mexican state broadcasting and productions. “This expanded coverage has been made possible, among other things, by the collaboration agreement between Once TV México and the Audiovisual Media Promoter, with which this decentralized organization is beginning to operate. It is thereby achieving one of its main objectives, helping to expand the supply of public broadcasting services, not only for Federal Government but for the Mexican state,” he said. 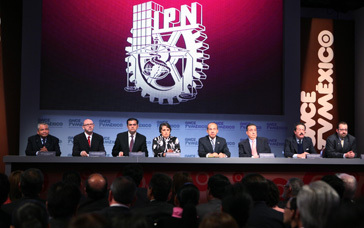 At the Once TV México Offices, the President, accompanied by Secretaries of the Interior, Fernando Gómez Mont, Public Education, Alonso Lujambio Irazábal and Communications and Transport, Juan Molinar Horcasitas, the President explained that this will increase coverage from 28% to 42% of the population, the aim being to reach 50%. “We have already begun building broadcasting infrastructure in cities such as Monterrey, Durango, Mérida and Oaxaca, through which, over the next few months, and no doubt this year, the Channel 11, from Once TV México, will reach virtually half the population and we will continue advancing until it reaches all Mexicans throughout the country. This puts us on the right track for ensuring that in the near future, all broadcasts will be available in every home in every region through the conventional antennas we are installing,” he said. Moreover, as part of this expanded coverage, the President also announced the digitalization of the Once TV México signal, whereby television will be transformed into an instrument of two-way communication, between the broadcaster and the audience. “In the knowledge era, Mexico needs television that provides knowledge, with state productions that can provide and diversify the supply of educational, scientific, technological, artistic, cultural and information television. A public television that will promote the democratic debate on ideas. A television that encourages calm, profound reflection on the country’s challenges and problems. A television that promotes human development, social cohesion and the construction of a more responsible citizenry. A type of television that meets the demands of a country that is continuously being transformed and of a society that is hungry for information,” he explained. He said that it is crucial to consolidate the leadership of Once TV, with its Spanish-language cultural and educational contents. That is why he invited them to “continuing carrying out their task of providing healthy entertainment and of educating throughout entertainment, informing, providing alternatives, analyzing and minutely examining national reality, as that great National Polytechnic Institute Student Guillermo González Camarena, the creator of color television, wished. “I want you to go on proving that quality does not reduce ratings and that the truth is a public asset that Mexicans must never give up. I want you to continue to strive to make excellence the hallmark of this television station and ensure that excellence attracts more audiences,” he explained. Inauguration of Teotihuacán, City of the Gods Exhibition.